PT Gudang Garam Tbk - PT GG or commonly known as Gudang Garam is one of the largest cigarette manufacturers in Indonesia. 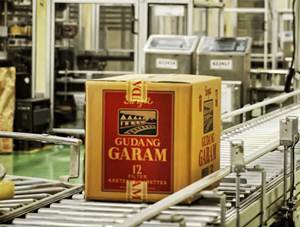 Gudang Garam was formed in 1958 as a home industry by the late Mr Surya Wonowidjojo in Kediri, East Java. In 1971, this home industry was officially organized as a limited liability company. The Company has been listed in the Jakarta and Surabaya Stock Exchange (now Indonesia Stock Exchange) in 1990 with stock code of “GGRM”. Currently, the majority of Gudang Garam’s shares are owned by PT Suryaduta Investama (69.29%), PT Suryamitra Kusuma (6.26%) and the remaining is held by the public (24.45%). Gudang Garam is based in Kediri East Java and its plant are located in Kediri, Gempol, Karanganyar and Sumenep. PT Gudang Garam Tbk also supported by 2 representative offices (Jakarta and Surabaya) and 5 directly-owned subsidiary companies; PT Surya Pemenang, PT Surya Madistrindo, PT Surya Air, Galaxy Prime Ltd, and PT Graha Surya Medika. Gudang Garam managed to recorded good performance in the business year of 2016. According to PT Gudang Garam Tbk Annual Report 2016 as cited by JobsCDC.com, the Company registered total net sales revenue of Rp 76.27 trillion in 2016. This total revenue figures reflected an 8.39% increase from Rp 70.04 trillion in the previous year. Referring to its annual report, Gudang Garam’s total profit as of the end of December 2016 amounted to Rp 6.67 trillion, up 3.40% from Rp 6.45 trillion at the end of December 2015. Background in Diploma (D3) in Mechanical Engineering, Energy Convertion. Hands-on technical experience in AC/Chiller is preferred. Willing to be placed in Kediri/Pasuruan. Male, maximum age of 28 years old. Minimum Diploma/Bachelor holder or equivalent (D3/D4/S1) in Electronics Engineering, Mechatronics Engineering, Instruments Engineering, Physics Engineering. Willing to be placed in Kediri/Pasuruan/Sidoarjo. Minimum Diploma/Bachelor holder or equivalent (D3/D4/S1) in Mechanical Engineering. JobsCDC.com now available on android device. Download now on Google Play here. Please be aware of recruitment fraud. The entire stage of this selection process is free of charge. PT Gudang Garam Tbk - D3, S1 Fresh Graduate, Experienced Technician Gudang Garam July 2017 will never ask for fees or upfront payments for any purposes during the recruitment process such as transportation and accommodation.